Worldwide, hardwood lumber producers “grade” their lumber, assuring downstream consumers of the lumber of the lumber’s quality for the intended use. Put simply, lumber grading serves quality assurance needs. Determine the species. Some species must be processed according to special rules. Determine the surface measurement (SM). SM is the width, in inches and fractions, times the standard length in feet with no fractions or rounding, divided by 12 with the answer rounded to the closest whole number. Determine the poor face, which is the side with the lowest grade. Assume a trial grade for the piece of lumber and then see if all the conditions for that grade are met. Determine if lumber size requirements (length and width) are met for the chosen grade. Determine the number of clear cuttings that are permitted. Determine the cutting yield required by multiplying the surface measurement (SM) by the grade values respectively. The required yield is expressed in cutting units. A cutting unit is 1 inch wide by 1 foot long. Locate cuttings to obtain the maximum area; then calculate the cutting area. Make sure the cutting sizes are not below the minimum size for the trial grade. When the piece grade is No. 1 common, check the reverse side to see if the reverse is FAS grade. If so, and if a few other requirements are met, then the piece is Select or FAS 1-Face. Check to make sure that the piece qualifies for the anticipated grade in all other respects, which include the amount of wane, the amount of pitch outside the cuttings and so on. FAS: Shorthand for “First and Seconds”. FAS is the highest grade of hardwood lumber. 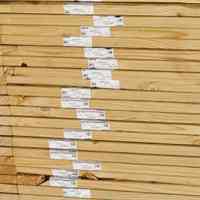 FAS 1-Face (abbreviation: F1F): A “Select” piece of lumber which is six inches and wider. Select: A No. 1 Common piece of lumber (the poorer side of the wood piece is assigned as No. 1 Common grade) and the reverse side (the better side) grades FAS. The price of Selects and 1-Face is usually the same as FAS. Often, Select grade lumber is used in the Northern U.S., while 1-Face is used in the South. No. 1 Common is the standard furniture grade lumber and provides a good selection of long, medium and short cuttings at a reasonable price. No. 2A Common (also known as No. 2 Common) is the standard grade for cabinets, millwork, and other uses requiring medium to short cuttings. No. 2B Common is the same as No. 2A Common, except that stain and other sound defects are admitted in the clear cuttings. It is an excellent grade for painting. No. 3A Common is often combined with No. 3B Common, and the combination is sold as No. 3 Common, which is widely used for flooring and pallets. No. 3B Common is graded on the basis of sound cuttings rather than clear cuttings. It is widely used for pallets and crates. Understanding grading categories can help with both selecting the appropriate wood stock for your intended woodworking project and, with the help of an accurate wood moisture meter, for ensuring a successful and satisfying end product service life as well. Knowing the importance of moisture measurement and management all through your woodworking or wood flooring projects is crucial to achieving the best in performance and durability. 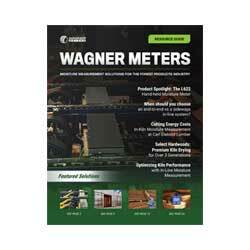 Wagner Meters offers accurate solutions for those moisture management priorities. 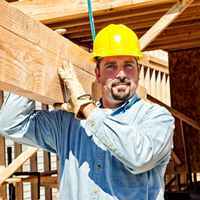 Thank you for posting the information on Hardwood Lumber Grading. While reviewing we noticed something of interest. re: FAS 1-Face (abbreviation: F1F): A “Select” piece of lumber which is six inches and wider. Would it be a good thing to also mention the ‘length’ as being eight feet and longer? Since six inch wide Select is not F1F at six or seven feet in length. Thank you for bringing this to us to our attention. We will be making some revisions to this article at a future date. Are you aware of “S1F Grade”? came across this while purchasing some Alder. Apparently better than 1COM. Any input would be appreciated. I am unfamiliar with it. It sounds like it might be a proprietary grade; not sure.